Betway has been around for a couple of years having been established in 2005. Run by the Betway Gaming Network, it offers one of the biggest selections of games, thanks to its partnership with Microgaming. All of their games can be accessed through either the website or mobile platform with no need for any downloading. Players won't need to worry about safety and security either when accessing it, as the site is licensed with the Malta Gaming Authority. For new players joining up, it is important to check whether you are eligible to play as there are a number of countries that are restricted. These include, but are not limited to, France, Australia, Romania, Russia, Greece, the United States, Netherlands and Singapore. For those countries that are able to play here, Betway offers an outstanding platform to access nothing but the very best in casino games as well as sports betting. The sports betting section of Betway is where this gambling site stands out from the rest. It offers a huge range of sports betting options covering almost every sport imaginable. From basketball to horse racing, it has everything, even the more recent addition of esports is available. The entire site is highly navigable, with an easy user interface enabling players to find all of these aspects out for themselves. Betway follows the trend of all online casinos and offers a large number of different bonuses to new and old players alike. This helps it to stand out from the crowd whilst also affording players the chance to test out their site, see what it has to offer and, if they want, to stay and play. Betway offers two different welcome bonus options. The first is for the sports betting part of the site and offers players £30 worth of bonus bets when they make the first deposit of just £10. The second option relates to those players who are wanting to play at the online casino. This offers a 100% match on any first deposit up to the value of £250. Further deposits made will receive varying match deposit bonuses as well, making this a long-term bonus. All online casinos have wagering requirements as part of their safety protocols, ensuring that players do not abuse the system. These requirements must be met in order for the player to be able to withdraw any winnings made from the bonuses. In Betway’s case, this wagering requirement is set at 50x meaning that any wins garnered from the bonuses must be played through this amount before a withdrawal can be made. Failure to meet these requirements will see the bonus being removed from the player’s account. Betway is a veritable fount of bonuses. Each day, there are different bonus options available across the various sections of the site. There is a Free Bet Club that can be joined awarding players a £10 bonus bet every week. Other areas within the sports betting section offer a four-to-score option as well as bonuses on esports. 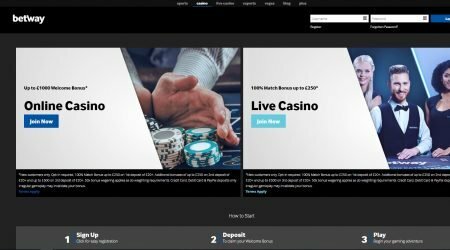 The casino part of the site is not to be outdone, with a 100% match up to £250 also available for the live casino as well as the virtual casino. 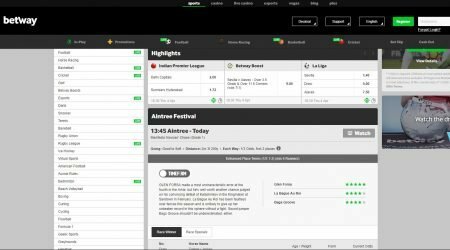 It’s well worth checking out the site regularly to see what other promotions come up – Betway is always striving for bigger and better. Betway’s game selection is one of the best out there. The slot section is vast, offering a huge range of games including classic three-reel games, complex five-reel video slots and, of course, a selection of progressive jackpot options. Many of the most popular slot games are available, including Starburst, Cleopatra, Wild-O-Tron 3000 and Dead or Alive. Microgaming’s hugely popular jackpot game – Mega Moolah – is present, and always shows the current jackpot just waiting to be won. Other games’ areas are just as well stocked. The virtual table games leave nothing to be desired. There’s a solid collection including baccarat, blackjack and roulette. Each of these has a few different options in game style and bet limits, just to keep things interesting. Video poker players are also catered to with a number of options available such as Jacks or Better, Aces and Faces and even Double Joker poker. These games are also available in single and multi-hand versions so that those who want to challenge themselves, can. Finally, there is a live casino, something that no good online casino should be without. This also features a huge number of game options including the classic roulette, blackjack and baccarat trifecta. There are a number of poker options available as well including Caribbean Stud poker, Casino Hold’em, Three Card poker and Texas Hold’em, all exhilarating, ready to get your heart pumping. If that wasn’t enough, there’s also a football studio and a Dreamcatcher game if you want to try your hand at something a little different. Betway offers a huge number of sports betting options. This covers all the usual sports available, providing the best, most competitive, odds. Each sport has a range of bet types to choose from and some sports can even be watched live, allowing players to continue making bets during this time. There’s an inordinate number of extra betting bonuses in this section of the site too. When it comes to payment options, Betway has everyone covered. Both withdrawals and deposits can be made through Visa, Mastercard, and a number of different e-wallets, including Skrill, PayPal, and Neteller. There are many more options and these will also vary between countries so it’s worth checking out your specific options before making a final decision. Deposits occur instantly, credited directly to the player account. Withdrawals have fewer options than deposits and will take slightly longer to process. E-Wallets are the fastest withdrawal methods, taking anywhere from 2 to 24 hours. Card withdrawals take a little longer – up to 2 days, with bank transfers taking a similar amount of time. In addition to these times, the casino itself needs some processing time to verify the withdrawal adding to the overall wait. Betway offers round the clock customer service in order to help players with any issues or concerns that they might have. Contact with a staff member is available via email or the live chat function. The latter method means that players will not have to wait long, just a few minutes, before their query is answered by helpful and polite staff. For those who feel their query might not be so urgent, there is a Help section that covers almost everything and should be the first port of call for any issue. The customer service, like the website, is also available in a number of different languages including English, Danish, German, Italian, Norwegian and Polish, making this one of the most comprehensive support systems around. Betway offers an absolutely excellent gaming platform. With all the different gaming sections at your fingertips, you’ll be hard pressed to decide where to start. Everything is easily navigable and there’s a dedicated Betway app to download if you want easy gaming access on the go. The sports betting site offers competitive odds, ensuring you’re going to get the best out of it all and every area has continuous bonuses available. Security is top-notch with the entire site covered by an SSL encryption protocol so that players know their data is completely safe. The casino is licensed with both the UK Gambling Commission and the Malta Gaming Authority – both of whom have strict requirements that must be met by the casino. The sheer number of games on offer across the two casino sections means that Betway casino is a must to check out.